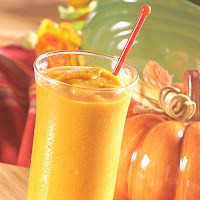 Try this Late Harvest High Protein Pumpkin Smoothie, (which you can find with my other high protein smoothies in SOUPer Slim), as a yummy, high protein alternative to pumpkin pie and all the other fall/winter sugary, high Calorie desserts that will expand your waistline between now and the New Year. Orange colored squash varieties are chock full of powerful phytochemicals (or plant chemicals), such as antioxidants, vitamin C, and betacarotine, which is helps improve your vision. 1. Place the canned pumpkin, honey, pumpkin pie spice, and yogurt or reduced fat tofu in blender. 2. Pour in juice and process until blended well. Serve immediately. May store in refrigerator for up to 3-4 days. Yields: 4 Servings. Serving size: 6 ounces. Nutritional Content: 140 Calories, 0.4g fat, 2g protein, 34g carbohydrates, 20mg sodium. *May top with 1 T of nonfat, whipped real dairy topping (a free food portion) and a dusting of pumpkin pie spice mix. For more delicious, healthful, and quick holiday recipes that will get you through the Thanksgiving, Christmas, and New Years Eve without packing on the pounds, visit www.LindaLaRue.com/club.html.